so can the bees because they arrived like clockwork at 10am to our Russian -designed Bait Hive by — Dr. Leo Sharashkin, Editor of “Keeping Bees With a Smile”. To be part of the Rebirth of the Hive never gets “old”, it is so Beautiful and Life Enhancing to the Soul of both us and the Earth! is around 200 years old and we knew it had rotted completely out on the inside, but it was so beautiful to look at, even in its decaying state, that we had left a 10 foot high trunk of the tree standing and this is where we placed the bait hive. This swarm was very large and they arrived like a long wave onto the trunk of the tree. It was amazing to watch the bees follow the many paths and contours in the old bark and flow up the trunk like sap in the Spring and into the box. As the bees were still arriving we called Dave and Lois, our special friends of the bees, and they arrived with cameras and excitement. It was truly a morning filled with Joy to witness this cosmic-earthly event. The sound was so soft and the bees were so peaceful that we felt a very special connection to this Swarm . We all decided to have a turn at greeting the bees by climbing the ladder and tickling the bee beard hanging off of the box and the bees seemed to be very happy to have us attend this great Rebirthing Event. Now the bees are settling down and we will wait until this evening to bring them down from the tree and properly Hive them into a larger home. 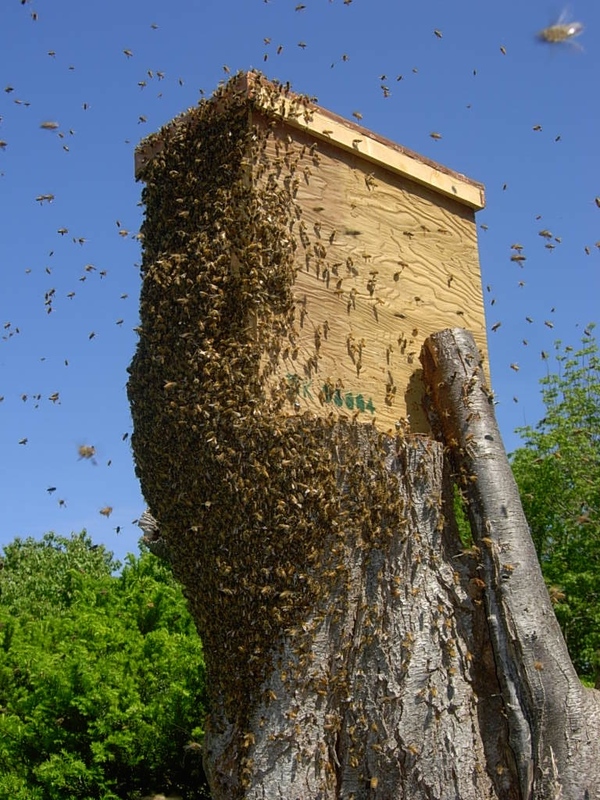 This swarm was so huge that they took a long time to all get into the box. Because these were not bees from our Sanctuary we need to take precautionary measures for the first two years to make sure they are healthy and happy bees. The “Swift Bees” which we rescued from a chimney a couple of years ago are just amazing and intelligent bees. They did not wish to be moved from their isolation location after the two years were up and so now that temporary location has become their Home Sweet Home. We did have scout bees come to our honey house again this year and we put out a full super on the deck in case they voted for this location; however, the Swifts were out on their own in the wilds for a couple of years and had gained some “skills”and decided to fight off the scouts to the bait hive which was somewhat near “their territory”. These Swift Bees are tricky and Klaus is always laughing at the behaviours which he observes with this particular hive. He also recognizes in them a truly “natural nature” which is strong, “Free” ,kind, quiet and hardworking- quite like many of the people we meet living here in rural Nova Scotia. 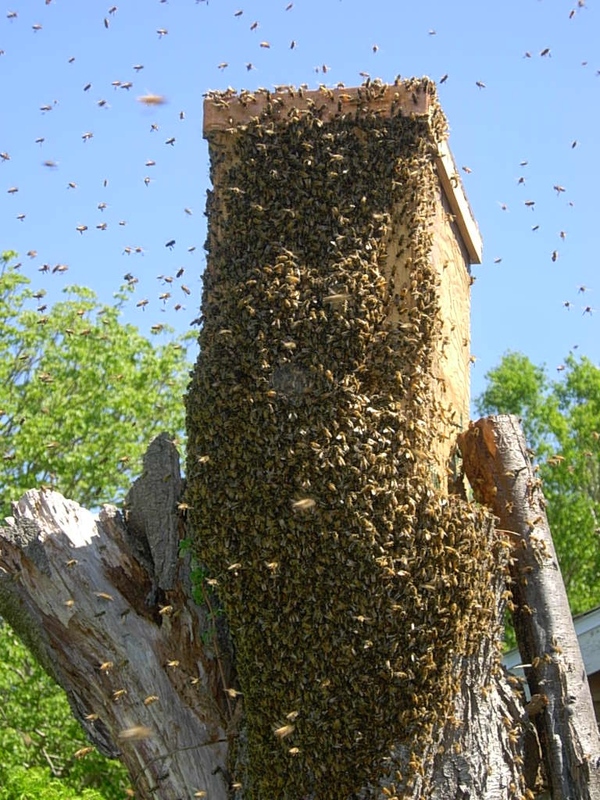 We look forward to having a nuc from this hive at some point and let’s hope that the drones from this hive are mating with the Queens from the other hives, so that these traits become part of the new hives yet to come!